A Faculdade de Psicologia e de Ciências da Educação da Universidade do Porto (FPCEUP) acolhe, no dia 20 de fevereiro, o workshop “The Brief Strategic Therapy Approach for the Treatment of Mental Health Problems”. A sessão será dinamizada por Giada Pietrabissa, docente e investigadora de pós-doutoramento na Faculdade de Psicologia da Universidade Católica de Milão. A iniciativa parte do grupo de investigação em Dinâmicas Relacionais, Processos de Mudança e Bem-estar do Centro de Psicologia da Universidade do Porto (CPUP). Empirical studies have shown brief strategic therapy (BST) to be clinically effective in treating several psychological disorders. BST is a solution-focused approach aimed at subverting an individual’s reiterated ineffective attempts to solve a problem - but that actually maintain or exacerbate it. BST does not focus on identifying the causes of a given problem, but rather on what maintains and reinforces it in the present, simultaneously intervening to disrupt dysfunctional perceptive-reactive systems through the use of the strategic dialog or the implementation of specific heuristic maneuvers. This workshop the main principles and techniques of BST will be introduced, as well as specific treatment protocols for several mental health disorders. 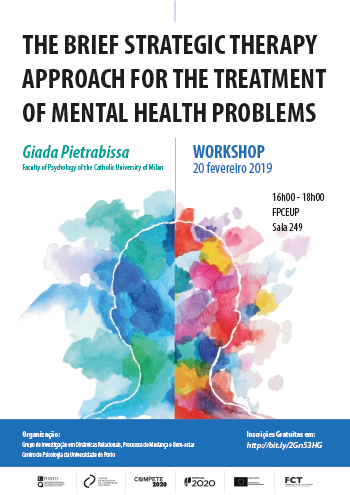 Dr. Giada Pietrabissa, Ph.D., Psy.D., is Adjunct Professor and Postdoctoral Researcher at the Faculty of Psychology of the Catholic University of Milan. She also serves as research psychologist in the Clinical Psychology Lab and Service at the Institute for Treatment and Research (IRCCS) Istituto Auxologico Italiano, San Luca Hospital, Milan, Italy. She is author of several articles published in academic peer-review journals and book chapters in the field of health care, and she is Associate Editor for Frontiers in Psychology, Clinical and Health Psychology. Dr Pietrabissa has expert knowledge and experience in using a variety of therapeutic approaches including brief strategic therapy, motivational interviewing, and schema-focused therapy for the delivery of individual or group interventions to promote health-related behaviors among adult and youth suffering from obesity, eating disorders and cardiovascular diseases or other chronic conditions.